Hi, I’m Priya. I am an Electrical Engineer. I ventured into Interaction Design to understand human side of making things. I freelanced for a year and majorly worked on few mobile applications, interactive toys and couple of gaming projects-both board games and digital games. Astronomy is one of my strong interest and I’m yet to make a solid space themed game. I’m posting one of our test videos for the augmented reality game that I was working on before I left India for CMU. Planet Found from Priya Ganadas on Vimeo. The purpose of this installation was to respond to real time sound input from equipment and live performances. It was the intention of SOFTlab to create an environment which visually displayed characteristics of music being played at SONOS. This project engages music in a very unique way that goes beyond a visualizer. The complexity of the patterns made by the lights and the depth of input make the installation very responsive. The complexity of the display, and how it physically relates to the sound itself is great aspect to further investigate and think about going forward. The purpose of this installation was to explore sound as a constantly evolving system. The artist wanted to create a space that started with one sound, but built the ambient sound of the space on top of each subsequent recording. One side will record the other, and then play it back for the opposing side. This creates an ever evolving loop that includes all active participants and the space itself. The idea that the character of a space can be displayed and collected in a compressed auditory manner is very intriguing. The idea of creating opposing components that build on each other makes it a valuable piece to study. This piece of interactive art turns sound into a visual painting. It was the intention of the artist to expand the boundary of interaction between music and visual art. This project uses genetic algorithms to process audio data into a painting style. This style becomes a evolving guideline for the image output. The robotic system uses a controlled paint brush on canvas to generate the visuals. This project displays a very unique way of processing audio input into a framework of guidelines. Studying this project may be helpful to clearly define a relationship between an input and output. Mogees – Gesture recognition with contact-microphones from bruno zamborlin on Vimeo. Mogee allows any surface to become a platform for creating sounds and music. By using a contact microphone, gestures are recorded and interpreted by software to turn them into specific sounds. The project creator wants to give people the ability to create music in any setting through interaction with the environment. This product is great because anyone can use it, not just those with a musical background. Bruno Zamborlin’s Mogee could be useful for my future projects because it is engaging, targets a broad audience, and changes the way people perceive music using a contact microphone device. A drawback of this device is that it is very disruptive to the surround environment. Synesthetic Timeline @ Fraport Airport (2013) from james clar on Vimeo. James Clar is an artist who visualizes sounds from the surrounding environment using a combination of computers, microphones, and LED lights. This light structure provides real-time feedback of ambient sounds. The one problem I see with this project is that it’s an art installation and not necessarily a functional design. Therefore, effectively communicating noise level to a broad audience is not his first priority. However, I am attracted to this work because it uses a combination of visual design and technical skill to create something people can appreciate. One thing I can borrow from this project is its focus on great aesthetics. Eidos Audio is a wearable device that enables the user to use selective hearing. It is similar to noise cancelling headphones, except for the specific sound the user wants to hear. The device uses three microphones (Left, Right, Middle) to detect sound, and its software filters out noise from the left and right microphones. However, sounds detected from the middle microphone are directly outputted through the internal middle speaker (located near the mouth) allowing the user to only hear noises right in front of him or her. I like this project because it has many practical applications and solves a problem many people have. A drawback is the inherent function of the device itself. By eliminating “unwanted” sounds, a person’s experience and perception of an event is severely altered. This may have negative consequences on how the user may act. In addition, the creator could have made the device less cumbersome because it looks like a giant hockey mask. This project gave me a new perspective because I learned microphone can also be used to eliminate sound, not just detect it. In this project, Bruno Zamborlin, uses a microphone to detect when people are tapping an object. The interesting thing that Zamborlin is doing here is to make the device portable as well as customize the sounds the it creates. This, as demoed in the video, creates the impression that different surfaces or objects are different instruments. This project brings an old technology into new use by using dual-tone multifrequency signaling to allow researchers to communicate under water. To me, this is an interesting project since it is sending the same message, but changing the medium of the message in between the recipients to break the problem of traditional sound not traveling well through the water. Resonant Chamber | Making from rvtr on Vimeo. This project allows for the roof of the performance room to be changed to allow for optimal acoustics. While the initial version of the project is done via manual controls of the structure, they do plan to later add microphone input to make instant changes to the structure based on the music being played. The concept as presented shows how sound could effect space and make dynamically transform to a desired state. Link to paper. SpiroSmart is a technology that allows users to test pulmonary function by blowing into a microphone on a cell phone. The project uses a custom mobile application that measures input from the phone’s built-in mic. The intention of the project was to determine whether at home spirometry could be a viable option to measure health related outcomes. I was attracted to this project because it was such a simple yet powerful way of using existing technology to improve health. Link to project. This project utilizes a transducer to detect vibrations on a transparent glass panel. I thought this project was an interesting way of communicating with people and interfaces in a more immersive way. Microphones are attached to either side of the panel and allows users to communicate “through” the wall. This project is aimed at turning normal every day surfaces into an audio interface that users can interact with both visually and haptically. I thought that this project was a creative exploration in converting mundane objects into sources of creativity. It was also interesting in that it turned those surfaces into their own type of “products”. It brought the creative/play process into the immediate environment. Knock Knock @ HEAD media design from Khalil Klouche on Vimeo. In this project, the creator aimed to create a product for children that would help them learn math, through interacting with the piece of wood through knocking. 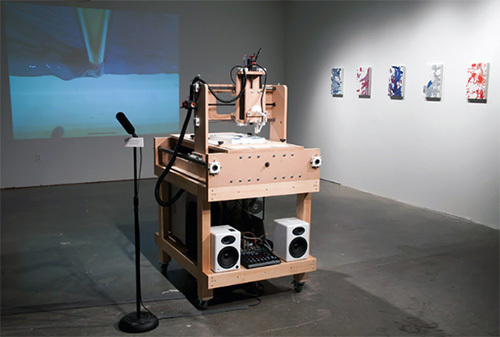 The project uses an Arduino board, contact microphones, solenoids, and some wood materials. I find this project interesting from a UX perspective, as I do not immediately understand how it works. I would be interested to see if a child could pick it up and use it without any instructions. This project has a good, clean, stable video to show how it works, and this is something to learn from in the future. I could also learn about the knocks and how solenoids work. The creator could have explicitly stated how the device works in terms of how you should knock to produce a certain answer. In this project, the creator aimed to create a lamp that seems like it has human-like playful qualities, somewhat akin to the Pixar Lamp. hacked webcam, microphone, mechanical iris, 2 servos and halogen globe. A lot of the components were laser-cut. I find this project interesting, as I am guessing that some machine learning was needed for the facial recognition aspect of the project, and I might need to incorporate some machine learning for my final project in the class. I think it is very interesting that the project takes an otherwise inanimate, everyday object, and makes it have personality. Although this may seem intrusive, this technique could be used to convey useful information in a way that is less obtrusive than adding another product to someones life. I would have been interested to know what, if any, practical applications the creators saw for their product. So.. I was at a party last night from Andrea Cuius on Vimeo. In this project, the creator aimed to create a luminary experience for a performance that allows the audience to further immerse themselves into the show. The project uses tungsten lamps, a microphone to record the audio, and a program to process the music. I find this project interesting because it is completely unobtrusive. From the video, it looks like the light seamlessly flows with the music, and that it enhances the experience that the user is already there to have. Using a microphone to enhance an already existing experience could be something to learn from for project 1. One thing the creator could have done better is to show more of how the lights were incorporated into the show, rather than just clips of the lights. Electrical circuits are often messy. 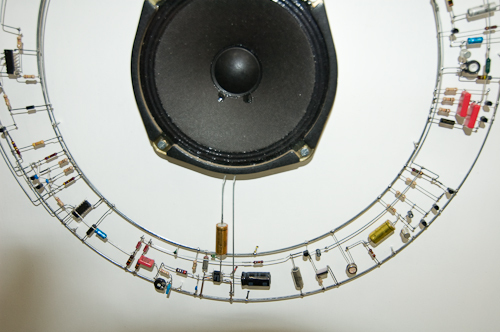 The artist creates a aesthetic 3D sculpture from functional electrical circuits connected to speakers. These sculptures are made interactive using piezo sensors, photo cells and microphones. The project consists of unique amalgamation of technology, form and sound. plis/replis is an 2012 installation by CMU professor Ali Momeni and his collaborator Robin Meier. It consists of a giant (10 x 10 x 12 m) origami inspired and digitally fabricated structure suspended inside an underground cave. The structure serves as a large speaker inside the space. On the focal point of the structure, a glass platform holds a vessel of champagne. Inside this vessel, there is a microphone that captures the effervescent sounds of the champagne. These then are run through software that translates them into a sound environment which continually evolves in response to the effervescent activity. The folds in the structure serve as metaphor for the relationship between mind and matter. The project in part aims to amplify the metaphors and experience of champagne. I like this project in part because of how it transforms the space in which it is at taking advantage of the qualities of the space itself, the size and its relative isolation due to it being an underground cave. I also like Prof. Momeni’s sound projects as they make the small sounds that we don’t pay attention to, hypnotic and grand. Tap Sense is a technology developed by CMU professor Chris Harrison (paper published UIST 2011). It allows touch screen devices to detect different types of touch through the help of the different sounds made when the finger touches the screen. Our fingers are extremely complex and functional, yet touch screens today interpret touch in a single way. Tap Sense takes the hardware that is in place and uses it to sense in a novel way, in particular, it uses sound to understand touch. The creative way of interpreting information is what is most appealing about this project to me. Taking existing stimuli from the world and interpreting in novel ways is something I want to borrow from this project. Blinkdrink is a commercial product that uses the microphone in the smartphone to react to sound. It is made by Brad Simpson who is currently at IDEO. The way microphones are used is interesting to me because of the social aspect. If you are by yourself and you activate your Blinkdrink app with a glass on top of it, you will see how it responds to the sound, more interestingly to music. If you are with friends, and each friend has their glass on top of their phone, every phone responds differently (at least based on the project video). Then it becomes more of a game around arranging in different ways the sound. This compact sized device is meant to measure vital signs to allow people to understand what their body is doing, comparable to what is measured while one is in the emergency room. It is less invasive than the traditional product. This product uses 32-bit RTOS Micrium platform, Bluetooth 4.0, micro USB Adaptor, Electrodes for an EKG that convert to FM sound signals and are sent to the built-in smartphone microphone. I find it interesting that amount of data that can be achieved in a short span of time, and I am interested in healthcare technology which this qualifies as. I can borrow the idea of compacting several elements to an object. The issues I have is that the data is only read for a short time not consistently and therefore not much can be determined from the data incorporated in the element. These earbuds are meant to track your everyday performance which working out. This product uses an earbone microphone, bluetooth 4.0, 4 GB storage, 32-bit arm processor, digital signal processor, analog frontend with 22 bit ADC, passive noise isolation, audio transparency, and other sensors. The earbone microphone records your personal vocals which reducing the noise surrounding you. When you run you understand your vitals, and are able to block out noisy elements. The products allows one to workout without invasive wires or noise, and monitors your fitness. Im attracted to this project due to the healthcare wearables, and would borrow the idea of a sleek compact design and important of bluetooth. I find that the product would need to be more interactive to understand its true potential as it relies on the smart phone to convey information. This object is a design idea, that hasnt been created. 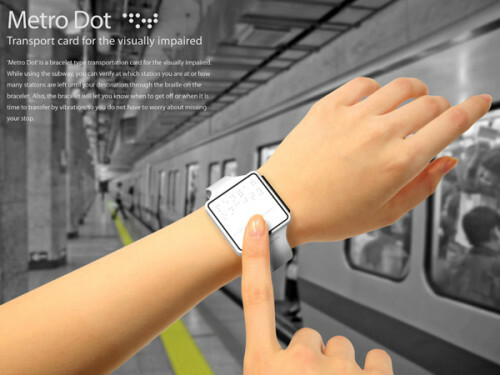 It utilizes a users voice and Electro Active Polymer, to give the braille of which station to get off at after the destination is given. There is silicone rubber, constant magnets, and Electromagnetic coil. I find this innovative as it is truly interactive and uses a microphone to convert information to be used by special needs. I find this use to be practical, but Im not sure how it entirely works.